I hope all of my friends and customers have had a wonderful holiday season. The holidays are a fun and busy time. I always feel like I'm in a whirlwind. I like many people ate too many rich foods, but I guess that's kind of what happens this time of year. Now it's time to get back on the track of healthy eating. 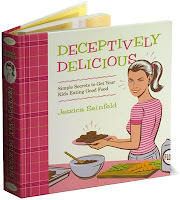 I have been inspired to return to my friends fruits and especially neglected vegetables by my new cookbook Deceptively Delicious by Jessica Seinfeld. I have in the past been skeptical about "sneaky pea" cookbooks. That is hiding vegetables in cakes to get people to eat them. I mean there is something to be said about eating a food in it's natural form, texture intact. And vegetables cooked correctly are really delicious. BUT, after almost 2 years of marriage I can really understand the value of this cookbook. I love vegetables and fruits, but my dear husband does not. No he doesn't hate them, but it is rare that he eats his daily recommended servings of veggies and fruits. So I would recommend this book highly for those of you out there that like to cook. 2. Vegetables go down better for non-vegetable lovers as part of mac n' cheese, muffins, ect.